Send us your head shot, branding images, and color scheme. We will customize your app just for your agency, to match your other branding materials. Keep customers on your app, not someone else's! Fast search for a great user experience. View and search for properties in list or map format. Search for properties in your current location. Favorite properties in search results and access them at any time. Sort by relevance, distance, price, and square footage. 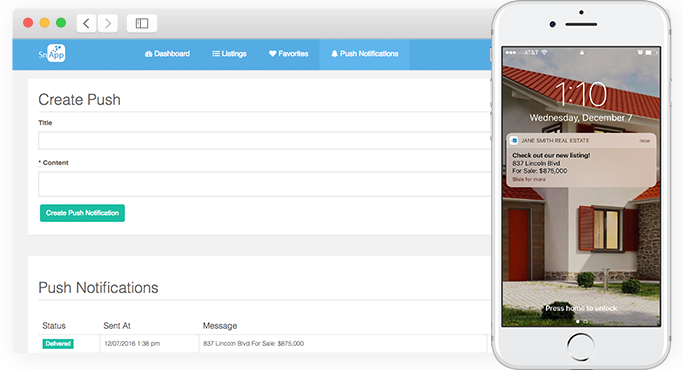 Filter by property type, price, bedrooms, bathrooms, square footage, open houses, and more. View nearby public and private schools as well as their rankings. Get estimated values and market trends over time with our easy-to-read graphs. Know the history and most recent sales of a listing. Know how walkable and drivable the area is with our Walk IQ and Drive IQ scores. Want to customize which visualizations are shown or access to more visualizations? No problem! Reach out to us. Send customized push notifications to your user’s. Our portal makes it easy to use and more effective than email. 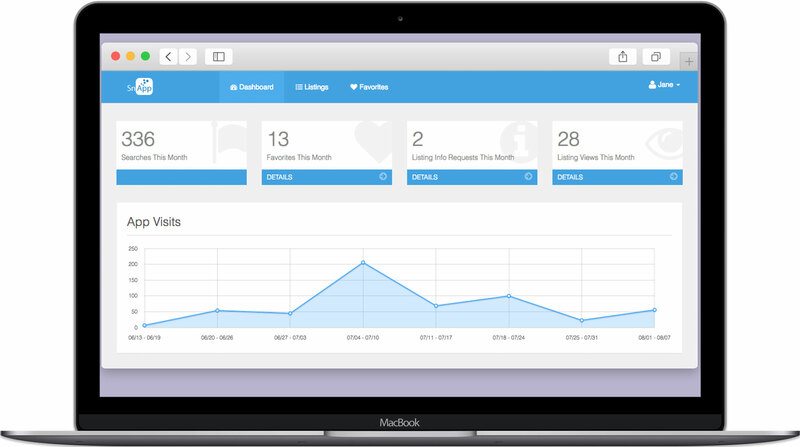 Easily notify customers about new listings, updates, upcoming open houses, and events. See how many users you’ve reached and how many clicked on your notification. Your own personal customer portal, showing all of the customers who have downloaded and registered inside your app. See how many users you have and how often they’re searching. View user details like contact information, properties viewed and favorited, as well as the last time they were active inside your mobile app! Check pending requests for more information on properties and get in direct contact. Invest in your own technology and keep your customers on Your App and streamline communication. Give your customers the ability to Select an Agent. He/She is paired with that agent for their app experience. Private label our platform and offer apps directly to your customers or refer them to SnApp for a revenue share. Our reseller program enables you to earn residual income by offering apps to your client base. Give all of your association members the ability to have their own app, directly integrated with your MLS. Download and check out our demo app! -All agents in the office are listed in the App. -Customer can "select agent of choice" and be "paired" with that agent. The app will only display this agent's contact info going forward. Supports up to 20 agents. Need more agents? Call for pricing. 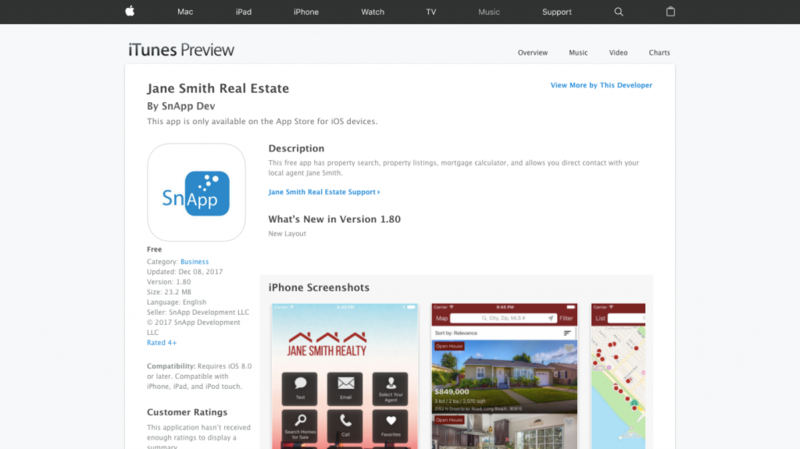 We discuss the features needed, then create a mockup of the mobile App for your real estate agency. 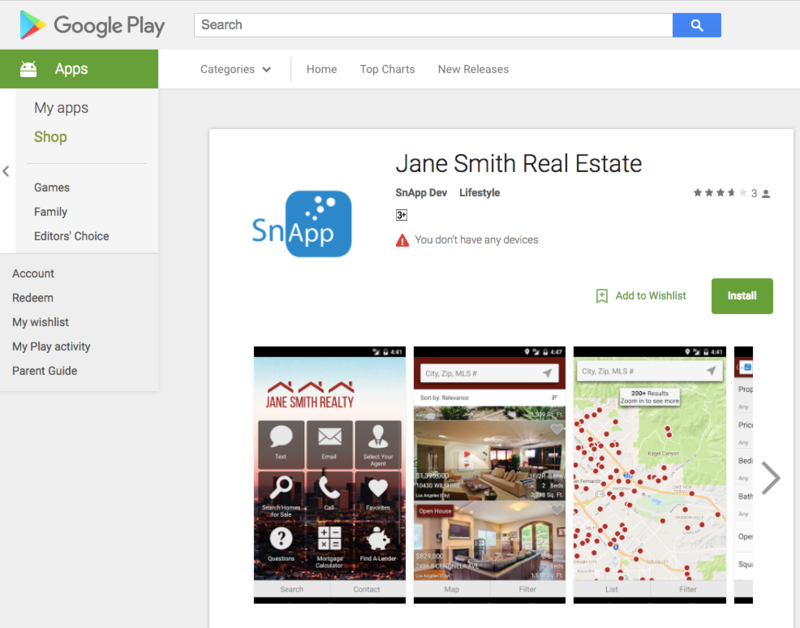 Mobile apps for real estate agents can vary greatly. We edit the design and/or functionality, based on your agency. Once approved, we publish your real estate agency’s App, and your clients can begin using it in days.